In this week's eat - shop - repeat (oh yeah it has come to stay) we're dealing with my problems - once again. Problem no2 : I'm a sucker for anything sickly sweet - preferably drinkable - and if it says Starbucks on, even better!! EAT : Or as I said above, drink!! I have been a loyal subject of the Starbucks realm for many years, but I hadn't tried heaven until my darling dear Bethany Mota shared the Cotton Candy Frappuccino (click for the video) with us mere commoners. It's a vanilla cream frappuccino with raspberry syrup - and some drops of unicorn tears apparently - and it's my new favourite addiction. SHOP : I went past an H&M and the rest is , as they say, history!! 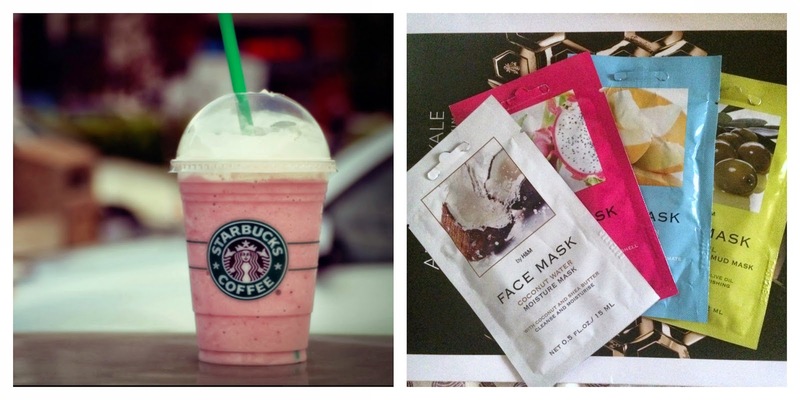 This time I went for skincare and stocked up in some facemasks (link). I tried to have some variety in my picks so I can have (and also give you) a better opinion. I got four to begin with and if they are as good as I've heard, then I'll be back for the whole selection. Stay tuned this week for a post on my experience with them. + Bethany also made a video recreating the Cotton Candy Frappuccino! So for anyone interested heeeere it is! !